I am a podcaster and content creator and I help people figure things out. I am frequently asked for advice on gear and what tools to purchase. The Holiday Gift Guide is a way for me to share the tools I use and those that I think will help others create online content or just enjoy life a little more. I own both the c920 & c930 and I use Macs. If I had to choose between the two I would say go with the c920. It is consistently better at auto exposure and auto-focus. I keep the c930 in my backpack for on-location and travel and for only $55. I would recommend to you that you keep a backup c920 on hand for travel and it can really come in handy when you need b-roll or a second angle. 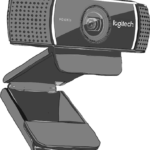 Logitech c920 Webcam is probably one of the hardest working gear I own.